The waiting time is over! 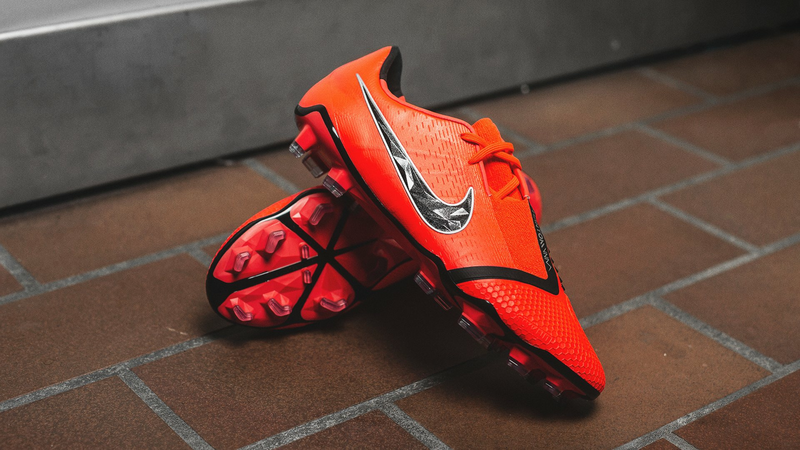 The Nike Phantom Venom is finally here, giving the ruthless finishers of the game the tool to end the job with precision. The new Nike Phantom Venom is all about precision as it’s going to be a part of the Phantom Series. The new Nike Phantom Venom will be the latest Nike football boot launched, which means that the Hypervenom silo is going into Nike’s Hall of Fame of football boots, as it’s retiring. You might look at the Phantom Venom and think: ‘This boot looks very familiar’, and you might have a point there. The Phantom Venom takes inspiration from Hypervenom in terms of mindset, while the looks take me back to the old school Total 90 boots. The Nike Phantom Venom is all about the giving the right tools to the ruthless finisher, that takes pride in doing it with precision. As mentioned the Phantom Venom will be a part of Nike’s Phantom Series, which means that it will feature the same reddish Game Over colourway as the Phantom Vision. The Game Over Pack is all about ‘Give me the ball’ mentality, as the players are the true Game Killers. The Game Killers have 3 stages: Firstly, they have the look, that only the Game Killers have, they can decide the game whenever they want to. Secondly, they kill the game before you even know that you had a chance of doing anything. And lastly, the Euphoria of killing the game, they take pride in what they do, and they show it to all the spectators. Expect to see Harry Kane and Alex Morgan killing the games in the all new Nike Phantom Venom. 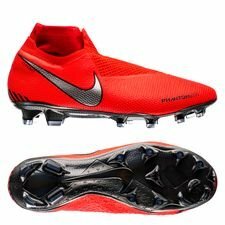 With the introduction of the new Nike Phantom Venom a lot of new technologies are also included, and I don’t know where to start, as they’re all awesome. Let’s start with the upper as the Phantom Venom comes with a full Flyknit upper securing you a great and dynamic lockdown and support through the Flywire cables. The upper also includes a semi high coverage of the laces, which gives you a larger striking surface, while the laces are asymmetrical, to gives the boot more lethal areas, so players can become Game Killers. Furthermore, this construction of the laces also gives you a greater boots-to-ball contact. The Strike Zone on the boot is the main new technology, which is inspired by Nike’s golf club, yes you read correct, golf clubs! Nike has added injected polyurethane blades on the upper, which creates spin, control on the ball for more precise and powerful strikes. Furthermore, Nike has also added a Honeycomb micro texture around the toe box for an advanced ball control. The Honeycomb pattern also offers a tighter fit, so you have the best possible control in small areas or during sharp touches setting up your chance to end the game. Compared to the older Hypervenom boots, the new Nike Phantom Venom comes with a new and advanced Hyper reactive soleplate. The new soleplate features hard TPU islands on the midfoot with creates the needed stability, while the toe area has softer islands, securing you more flexible, springy and responsive experience. The stud configuration is a bit mixed as you get two types of studs: chevron and rounded studs. The rounded makes it easier for you to turn around on the pitch, while the chevron studs gives a better grip on the pitch and let you move quicker. All in all, the studs and the Hyper reactive soleplate will secure you the best possible movement, when you are in the most vital part of the pitch about to kill the game. 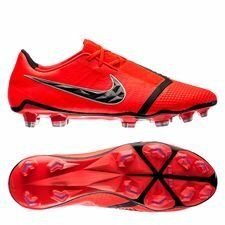 The Nike Phantom Vision is also a part of the Game Over Pack and comes with the similar reddish colour as the Phantom Venom. The colour indicated that the football boots are connected in the Phantom Series and are all about the precision and the Phantoms of the game. The Phantom Vision also includes a black triangular shape on the inside of the boots, which is the key area for controlling the ball and game. Furthermore, a silver Nike Swoosh completes the rather awesome colourway, which kickstarts Nike launches this year. The Phantom Venom and Vision will be available to get at Unisport from the 19th of January. Are you fancying yourself a pair, so you can become the next Phantom, then keep an eye out for the boots and cop you pair before your friends. Click here to see what the Game Over Pack has to offer. It is dangerous!